4PM Update - Just got off the line with the City Clerk's office and the voter turnout is stronger than it has been in years. 1,147 absentee ballots have been sent in, an unprecedented 51%!! Can we say tax revolt? More information as it becomes available. If you haven't done so by absentee ballot already, then you need to get out and vote today. There are a number of important reasons for doing this. Let me try and list them for you. 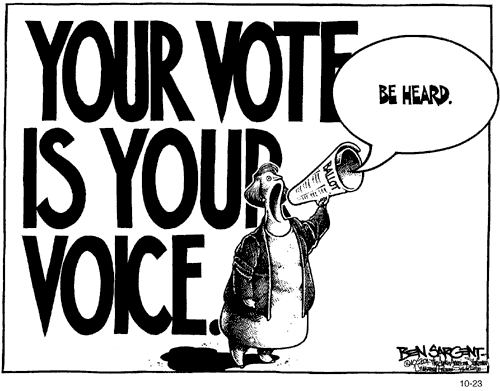 1) Nobody else can be depended upon to cast your vote for you. Judging by modern day voter turnout percentages, most people can't be depended upon to even cast their own vote, much less yours. 2) If you don't vote your taxes will go up. This is a proven fact. Government truly believes that the solution to its problems is to raise your taxes. And since they always have problems, your taxes get raised often. The only way to break that cycle is to vote. 3) The other side thinks it is smarter than you. The way you prove them right is to do what they want you to do, which is not vote. 4) You will wake up Wednesday morning and realize that you won't be able to do anything about the mess the city is in for another 729 days. 5) You will also lose the right to the second most important franchise that a citizen in a democracy possesses, which is the right to complain. 7) Ever since those in power realized that only a minority of the people in this town vote, they have only answered to that minority. Chances are good that you are not a member of that minority. 8) Your next City Council will be an emo one that will constantly tell you how much they care about you. All while steadfastly working behind the scenes for powerful out of town interests that want to cash in on your birthright. 9) Your next Mayor will have a goatee and compare your increased tax contributions with the prices at Starbucks. 10) Outside of telling your children you love them there is nothing more important for you do for them today than take 10 minutes and vote. It is their town, too. All indications are that today will see one of the largest voter turnouts in recent Sierra Madre history. In 2007 46% of all voters here turned out to cast ballots in the Measure V election. For a number of years now that has been the "big turnout" standard. Today's vote could very well go over 50%. The reasons for this are fairly clear. People are tired of a City government whose only solution to its problems is to repeatedly ask us to cough up more and more money. And nothing will change if we keep putting into office elected officials who only seem to know how to spend it. The rule of thumb is this. Candidates Braudrick, Goss and Harabedian don't have a problem with raising taxes. Or at least that is what they said when they first began their run for City Council seats a few months back. They were for it before they were against it. But once elected they will most likely be for it again. Candidates Capoccia, Koerber and MacGillivray want to break the raise taxes and spend cycle this City has been on for the last few years. They want to give control of this City back to the people who pay for it, not just leave it in the hands of those who take our money. It's now up to you. Vote. Looks like the slate has the illiterate vote in the bag. However it goes, it'll be nice to bid adieu to the faux poster @5:48, who's only here for the election. He's posted about 20 times. Some of them are quite violent. You hav to wonder why "the slate" is attracting people like that. The Civility Party has always specialized in dirt one way or the other, and it has always tried to maneuver public perception to believe that it has not done the very things it has done. Quite a study in the dark side of politics. Best of luck to my favorite candidates, MaryAnn, Chris and Capoccia. These are the people who are best qualified and will do best for all of us. I pray the unfair tax measure will go down to defeat today. It will hurt everyone, especially those will less income. Today we goose the taxers. Great article Tattler. Funny, and true. If you have VOTED, now the Job is to get everyone you talk to or know to Vote. Don't stop spending the word. We need to throw these bums out. We need to clean house. We need to replace the City Manager. Tattler, any plans to post the results as soon as we get them? I am expecially offended to learn that Sierra Madre has been collecting UUT in the thousands of dollars from just one segment of the residents: those who pay their internet with the cabel TV or phone bill. They are being taxed even more unfairly. I have another server so it does not hit me personally, but I don't like anyone to be treated unfairly. I learned that a friend pays more than $100 per year on the internet for the UUT. This is wrong, wrong, wrong. How do "we" know it's not true? Who pays your taxes? We do know! We had this discussion a couple of days ago on the Tattler. Check your bill. If you don't pay, then let us know which provider you use because we all want to change over. UUT doesn't apply to internet, data plans, or Directv. Its Federal law. Cant wait till this election is complete. I want the Tattler to get on with some more interesting stories like whats going on with Bob Matheson case. Also want to know about Josh Moran. Wasn't he married to personal trainer Lynda Linforth Moran. What happened there. She dropped the Moran name and moved to Florida? Dear 8:20 am, you must have confused the Tattler with the supermarket tabloids. Personally I wish Matheson would move to Florida and I don't care a whit about Moran's former wife. There are plenty of stories not being covered in order to report on the election. And, just maybe, Crawford would like to take a few days off and re-acquaint himself with his family. Dear Anonymous 8:42 - No I have not confused the Tattler with the supermarket tabloids as the Tattler has reported on the Matheson case and has reported on many items of personal human interest before. I enjoy the Tattler both for allowing people to vent and for opening up peoples mind. The Tattler is however slanted in one direction. Some of the people as this blog calls DIRTS, the Selective Few, the Troll, the DIC are all personal friends of mine that I find these names to be quite funny and amusing. Im not offended by that. Thats ok with me as I am intelligent enough to form my own opinion. I do enjoy the town gossip that bloggers write as I am sure you do to otherwise you would not be on this blog. You are entitled to your opinion but I want to hear more gossip, gossip gossip! The Tattler slanted? Good grief! Who'd a thunk it? I'm devastated. Go Tattler!!! Personally I'm only here for the graphics. Let me be clear. I am all for more stories on Bob the Pervert. and I am always down with stories about personal trainers. Seriously though...the thought of Josh Moran as Mayor is even scarier than a 12% UUT! Never mind about the progression of Mayor and Mayor Pro-tem. It won't matter if the No on the UUT tax increase candidates are elected. Go vote! Oh, I am sure all the readers registered to Vote in Sierra Madre will do, or have done, that. Do not sit home for any reason. If you need a ride let someone know. I think it would be best for soundly defeating Moran and Wash in their bid for reelection in two years (egad, more of this again?) to have them server at Mayor and Pro-tem, expose their foibles for all to really see. The point is a good one, but would we really want to put that much power in the hands of such obviously incompetent people? Based on his later awful performance as Mayor, keeping Joe Mosca on the sidelines was the right decision. Sometimes the greater good has to be put before politics. Raising taxes is not civil. Council Members in line to become Mayor in Sierra Madre are fond of telling you that the Mayor has no greater power than any of the other Council Members. That's not precisely true. The Mayor has always met with the City Manager and drafted the Council's agenda. For example, Joe Mosca met with the City Manager as soon as Kurt Zimmerman stepped down from the Council and agendized a controversial water rate increase. That's not to say that other Council Members cannot agendize items for action or discussion -- they certainly can. However, those non-Mayoral agenda items often must wait weeks or sometimes months before coming before the Council. In addition, it's usually the Mayor that is contacted by reporters for quotes, and for a year is the "face" of Sierra Madre in the media. Finally, in the face of disaster, the Mayor may be called upon to contact other government agencies for logistical and financial support and allay residents concerns. Our former Mayor Kurt Zimmerman did both during the Santa Anita wildfire. That's why it's essential that you elect two competent candidates: John Capoccia, and Chris Koerber and re-elect MaryAnn MacGillivray. Do you really want Josh Moran as our next Mayor? No, I don't want him even on the council! Josh Moran is creepy. Josh Moran as Mayor would hardly be the best face forward for this town. Who would you rather have. We all know mary-koerber-cappocio will not clean sweep. Name your city council. How do you know that? Please explain what you mean here. Playing the odds. Not that difficult to figure out votes will be taken from all candidates. Are uou saying mary_koerber and cappucino breath are a shoe in? The term is "shoo in." Not shoe in. You must be a "slate" supporter. It's 5:48 am again. He can't spell, he can't put together a logical thought, and the candidates he supports are equally flawed. Must be a pot head. I voted for Joe and consider him a friend. That having been said, he performed awfully as Mayor. The water rate increase was a disaster for the City. I'm afraid that Josh will be another Joe. Some of the votes Josh cast were pretty goofy -- like voting for unrestricted development in the canyon. Also, equating a tax increase with paying for coffee at Starbucks shows that he is really out of touch with the residents; especially the residents on a fixed income. Josh doesn't talk to people who don't drink lattes. Those who fail the latte' test need to leave town to make way for the kinds of development that will make lots of money for those he does talk with. 9:13 presents some pretty persuasive reasons why we need to vote for candidates that will not support Josh's bid for Mayor. In hindsight, making sure that Joe was passed over for Mayor twice, was the right thing to do. Joe's biggest sin was lying about the reasons for the water rate hike. He was Mayor and the responsibility for that one falls right on him. Moran, of course, backed him up on that one. Wait until Kurt and Don are off the Council, then immediately announce a water rate increase. That's pretty slimy. Joe figured Kurt and Don would tell the residents the truth. What did Joe fear about discussing the water bonds with the ratepayers? Did her have to lie, or was it just his nature. I am old school. I like to vote in person. So off to the Methodist Church I went this morning. There to greet me were the endomorphic and ectomorphic yin and yang of what passes for Sierra Madre Society. No, not Pervy Bob Matheson and Joe Mosca. Worse. That mean lady married to the mayor and crazy town mascot Carol Canterberry. Posted 101 feet from the door to urge that the the tax coffers be filled and that their chosen candidates are elected so that they can pursue renewal of the DSP. Yuck. Do not dispair. Once past the parking lot phalynx you will be greeted by nice women, inlcuding the awesome Pat Alcorn. Get out and vote NO ON 12-1 and 12-2! And while you are at it, vote for Maryann, John and either Colin or Chris. I like both of the last two guys, and each will serve the city well. 9:53, you are such a Colin troll! First you say "NO" on the UUT, then you say to consider voting for Colin, an on-the-record tax hiker. Give it a rest. Troll, schmoll. I have actually funded candidates and litigation you supposedly like. I'll bet you havn't. I happen to like Colin Brauderick as a person and a candidate. He has behaved as a gentleman throughout this election. For example, he openly defended Maryann against the unfounded allegations regarding the housing law. He directly confronted Nancy Walsh on the treatment of the general planning committee, which supported a vote on the ALF. He actually responded off script to comments on issues such as the contracting of police services. He, like Chris Koerber, will serve all citizens, not merely those whom Mrs. Mayor and Crazy Realtor Lady represent. Or, for that matter, those (like me) who regularly post on this blog. And while I would love to save $1.5 MILLION A YEAR by getting rid of the police department, none of the candidates have been willing to bite that bullet. Yet. So vote no on 12-1 and 12-2. Colin's still a tax hiker & supporter of yes on 12-1. That is a fact. Which crazy realtor lady? So many of them are. Colin has a different story for every pair of eyes. I think that is considered leadership where he comes from. Colin also accepted Nancy Walsh's endorsement. Kind of weird to lash out at her and then be backed by her. Joe lacked character. In the end, he probably could have convinced the voters to vote for the water rate increase, if he just told them the truth about the bond ratings. Instead he lied and lied and lied again about how the increase was necessary to replace rusty pipes. Ah, the story of the little boy who cried "Wolf" too often. We are reminded there are consequences to our every action. Joe lied because he had nothing but contempt for the people of Sierra Madre. He believed he could get away with it because nobody would make the effort or have the ability to figure things out. He was hardly the only one on this council, though. The fib on today's ballot about paramedics being the reason for hiking UUT rates in July of 2013 was the product of John Buchanan. Also a lie, and also an expression of contempt. The sad thing about the whole rusty pipes fiasco is that the pipes really do need to be replaced and the money should have been used for that purpose but the Council and City Manager chose to do a bait and switch in an effort to avoid revealing the real status of the bond default. Irony is they did raise the rates after some serious public outcry, and our Standard & Poor's water bond rating went down anyway. The gang that couldn't shoot straight in action. If Joe had just told the truth from the get-go none of this would have happened. Horribly incompetent. Give it up 5:48 am! We're on to you. I just vote no on the UUT. I feel ... empowered. In your face, dirts. I drink starbucks, dont mow my own lawn, laugh at conservatives, hate rush limbaugh, hate bill oreilly. Im voting for maryanne and koerber. The rest are on their own. Really small world... I drink Starbucks, don't have a lawn to mow, laugh at right wing conservatives, detest Rush Limbaugh and Bill O'Reilly, and I voted for MaryAnn and Koerber! And, I'm a lifelong Democraft. They represent intelligent, involved local citizens who have demonstrated an interest in preserving the values of the small town that is Sierra Madre AND carefully watcing my tax dollars. We'll know the outcome shortly after 8:00 pm. I'm keeping my fingers crossed and positive thoughts for the election results. Can someone in town go shoot some video of Teri Buchanan and Carol C. at the Methodist polling location? Email it to the Tattler. An iphone or Android would do the trick. Extra credit if they get p*ssed off at you. Are they trying to scare away voters? Enid Joffee did the same thing in the election she lost, dressed all in purple and stood around voting locations. It's a very creepy thing to do. 10:12 You should really read Crawford's petition drafted by our former Mayor Kurt Zimmerman. It turns outs that the money for the rusty pipes (i.e., water mains) didn't come from the water rate increase; instead, money had already been earmarked for the replacement of the mains from "REDEVELOPMENT FUNDS." The water rate increase was always about propping up our bond rating, so we could float more bonds and push Sierra Madre further into debt. Disgusting. If you are driving in town today watch out for the PD. They are on a ticket writing spree. There is a rumor that two slate campaign workers have been arrested for campaigning too close to a voting station. Anybody have anything on that? The slate candidates are endorsed by the SMPOA. Do you really think theier supporters got arrested? Get real. 11:13. Nice try, but nobody working for Buchanan's slate is getting arrested in this town. It's more like citizen intimidation. Cops have been stalking some of the No ON 12-1 and 12-2 volunteers' homes - most of us have lived here a long time, and have never seen so many cops stalking the blocks where we live. Pretty sad that our tax dollars are being used for stalking and intimidation. If you live an East Montecito you would be use to cop drive byes. The police have been stalking the Hildreths for a couple of years now trying intimidation them, forcing them to give up their fight with the City. The Sierra Madre Police have been violating their civil rights and the Hildreth are rumored to be filing a lawsuit against the Police Department. I glad someone is standing up for our rights. Thank you John Crawford, Kurt Zimmerman, Chris Sutton, and the Hildreths. Jeff and Taryn don't give up the fight. Thank you for staying strong. They are trying to intimdate people from going to the polls. Could one get a freedom of information request in to see ... I am not going to post the rest of this so as not to tip off anyone. I will let Kurt and bog mod know. Could be interesting. I was with someone who observed a ticket being given downtown. Asked what it was for. Never mind that. The most important part of it was that the officer gave the driver wrong information about clearing it. Does't the SMPD know the traffic violation laws? If Kurt ever leaves Sierra Madre, we're in deep trouble. I voted at 8 this morning. But I almost didn't. I am a Mexican male of thin build. I almost turned around when I saw those two giant white women guarding the polling place. I'll admit it. I was intimidated. Especially since the crazy zaftig one practically scared the wife and I out of her office when we tried to talk to her about buying a house in Sierra Madre six short years ago. On that occassion I felt like had mistakenly wandered into mental ward. But no, it was the Webb Martin office. Maybe they jsut don't like Mexicans in town. In any event, perhaps SMPD can look into this MINORITY VOTER INTIMIDATION issue once they get thourgh solving the EVG gas rip off. And the Valero gas rip of. And the SMPD union's steal money from old people fundraiser rip off. And the shooing of that poor borachon in the back of the Murano. and the Crawford robbery. Ok, Moderator, I nominate 1:07 for one of the funniest posts of this election season. What say you? Sierra Madre dirts as in the two tall, one fat, one thin women you encountered don't like Mexican people, but the rest of us do. A former mayor of ours, Doug Hayes, and his horrid wife, Janice Nelson are two of the head honchos of the dirts. Doug offended some very nice Mexican American people from El Monte that were at our Memorial Park with their children, who were Mexican dancers, who volunteered to perform at a holiday function. Doug insulted them! They came to city hall, and rightfully complained. It's a long story, but Doug Hayes is a real nasty person. Anyway, most of the dirts are bigots, their paid off "editor" of the Mountain Views News is a stone cold racist. She still owes her Mexican housekeeper $800, never pays anyone, she insulted the woman with a racial slur when the lady asked for her money...."me no money" and hung up on this honest lady who just asked to be paid. Yes, most of these dirts are very bad people. I'm sorry you ran into these two terrible ladies, Sir. However, thank you for posting this on the Tattler. We like people like you, in our town. I can honestly say that there are lots of nice white folks in this town. For example, I am told by the wifey that my youngest son is at this moment killing lots of commies on the video machine over at the Moderator's house. Please be sure to feed him before sending him home. Thank you to the Moderator for accepting us as neighbors even though the mean Webb Martin lady tried to scare me out of voting and wouldn't even talk to us when we tried to buy a house in town. You are not in touch with the happenings here today. I have "occupied" our one remaining television and am watching the Dodgers home opener. The disappointment the boys are feeling about this is palpable. The lads are currently walking Buddy the Dog at Bailey Canyon Park. Hopefully the coyotes are busy elsewhere. Thank you moderator for keeping such a close eye on the T-Man and sending him unescorted into the wild while you supervise from the front of the TV. My grandfather used the same technique, no doubt aided by a Budweiser or two, to lose my sister for three hours. Also, I need to clarify that the mean Webb Martin lady no longer works at Webb Martin. She now proudly represents another firm. And after she was mean to us a very nice lady in the Webb Martin office tried to repair the damage. I regret that I do not recall the latter's name, as she was saintly. They're back. Buddy is safe. Hey, where do we see results? Will they be in tonight? Yep. City Hall puts live numbers up on their site as they are tabulated. I'll be posting them here as well. Love the 4 PM update! Getting ready to wiiiiiiiiiin!!! Squeee!!!!! Heading to the polls after work this evening. Feeling so good about casting my ballot today. Vote! Vote! Vote! TAX REVOLT!! The Liberation of Sierra Madre is happening now! Just got a report that voters are lined up out the door at the Methodist Church. The City Clerk has called in additional clerks. Any reports from Congragational Church or Church of the Ascension polling places? that is total lie about realtor, there is no way i did such a thing, i have never been racist never turned away a client. my last 10 sales were to families that did not look like me! if you are for real why don't you say it to my face. and by the way webb martin ceased to exist in 2008. and this morning i never spoke to anyone but the 2 women on bikes and we only spoke of solar energy generator! get your story straight, and we have every rightto go in and see who has or hasnot voted, we each have 20 people that had promised to vote. Welcome to the Tattler, Carol! I cant figure Carol out. Miss Citizen of the Year. Devoted volunteer and loves Sierra Madre without a doubt. However, how can one support Colin and Moran or Harbedian. They are just not good for leading this city. Those 3 are just members of the good ol boys club. Which apparently Carol is part of that club. I guess they are called the Selective Few on this blog. I do know from my heart that people like Lamdin, Stockley, Hayes, Webb-Martin, Carol C and all the rest truly love this town. There is know doubt. I am just confused at why there is such division between these 3 candidates. I dont know how much increase in taxes there truly be on the UTT . If it only amounts to a couple hundred bucks a year, we should be ok with that. Everything is going up and if we need to pay a little more to live here so be it. This division is like Ive never seen in town before and I tend to be more friendly with the "Dirt" side. This blog however has enlightened me. I never knew MaryAnn M in the 15 years Ive lived here. After listening to her now I really think she is good for our town. She is a solid woman. I am a man and Ive drank a few beers with Moran and know that his family has a long love and history in town here but I dont think he's a good face for this town. He really needs to mature first before he represents us. I am not voting in this election because I am at an impasse with both sides. Sierra Madre we can all agree is a wonderful place but being involved with city affairs has spoiled my image of the place. It is best just to live my life and enjoy the area without getting to involved. It is my opinion that it was not the council that approved 1 Carter that destroyed that hillside, nor was it the developer. It was the group of citizens that did their best to put a stop to the project using every stall tactic they could. The project got so delayed that by the time Dorn Platz broke ground the economy was in the tank. If they could of got in there a year or so earlier we would have some beautiful new homes up there. Now we have a nightmare and a mess thanks to the group of activists that stopped the project. I suspect this group is the same group on this anti - Moran Colin Harbedian group. If so they deserve it. I do think there candidates are better qualified for this election though. Ok shoot me everyone but thats the beauty of this blog. Freedom of Speech. I admit it. I can't stop laughing over carol's crazy response. To be clear, I am the Mexican who JOKINGLY said I felt intimidated by the two giant white women this morning. The post was SATIRE. With one exception. We really did have a strange close encounter with the esteemed "citizen of the year" in the webb martin office six years ago. we truly were saved from our encounter by another kind woman in the office who realized we had been taken on a trip to zany land. the wife and i continue to laugh about it today. just as we will in future years laugh about carol's response tonight. thanks a million! PS: i hope you and the other big white chick enjoyed your apertif at Beantown tonight! Going to be a nail bitter. Will the election be determined by the absentee vote? Measure V was going down to defeat with the absentee vote because they did not know about the $170,000+ that the NO on V spent. We won in the end. Big turnout is bad news for the Tax Trio. Victory is in the air! If the horn honking, thumbs up, shouts of victory is any indication of the vote, we're going to win this one! Kersting Court rally was great! Glad to see this thing happen! FYI all: Cassandra at Patch, is doing a live blog from City Hall. 10:30 and the City Website shows it is a close call for the UUT. In your posting you referred to the city election in 2007. Don't you mean the 2008 elections? My ex-roommate gave her 30 days notice last month. The Money Race: And the Winner Is!